PUBLiCUS Founder/CEO returns to CLRG as training program speaker - PUBLiCUS Asia, Inc.
PUBLiCUS Founder and CEO Ma. 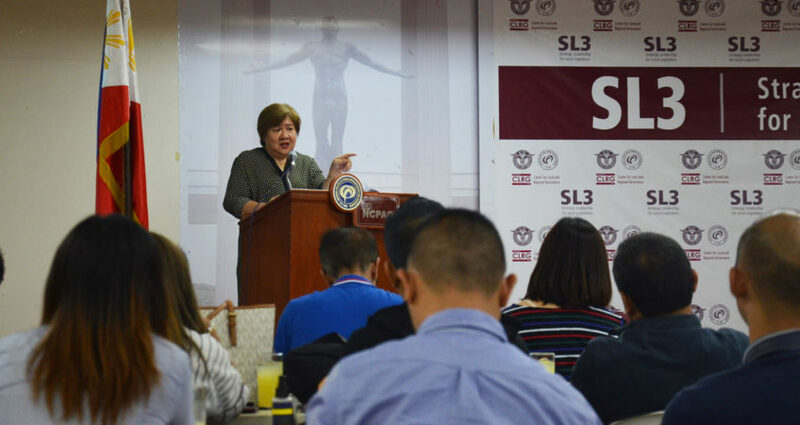 Lourdes Tiquia was once again one of the resource speakers in the UP Center for Local and Regional Governance (CLRG)’s Second Batch of the Strategic Leadership for Local Legislators (SL3) Course held last April 2-6, 2018 in UP NCPAG Case Room. The SL3 Course is part of CLRG’s continuing initiative of offering training programs to elective and appointive government officials. Tiquia, a renowned lobbyist and political strategist, who has extensive experience in public relations and campaigns spoke about Communication Strategy; Engaging the LGU Stakeholders; Lobbying and Policy Advocacy; and Social Media Today and Maintaining Good Governance. According to Tiquia, communicating effectively is a critical activity because government work requires an entirely new communication strategy that should be geared towards directing attention and more importantly, guiding the processing of information that promotes public understanding of government policies, initiatives and programs. Tiquia once again emphasized the importance of public policy advocacy. She said local legislators play a vital role in the development and implementation of public policy to promote an informed, healthy, and strong democratic society. Effective advocacy builds a public servant’s capacity to achieve the greatest good for the greatest number of people and communities s/he serves. Lastly, in her presentation “Surviving the Social Media Age: Maintaining the Good Governance Narrative” Tiquia discussed how social media has enabled local governments to be closer to the people and reinvigorated Philippine democracy. Aside from making information more accessible to the public, social media made it possible for government offices to directly respond to complaints and clarify policies conveniently. SL3 was a five-day course which offered approaches and insights on the roles of legislators as policy innovators, negotiators, advocates, crisis managers, and development framers. It included topics on decision-making tools, negotiation, policy advocacy, legislation in crisis situations, innovation systems, entrepreneurial governance, and strategic policy development. The aim of the course was to build the capacity of local legislators by equipping them with the necessary communication skills and knowledge to ensure effective communication of government policies and programs.